Looking to take a honeymoon that’s a bit off the beaten path? Many couples are choosing a Nepal honeymoon to suit their wanderlust. Looking to take a honeymoon that’s a bit off the beaten path? Many couples are choosing a Nepal honeymoon to suit their wanderlust. Located in South Asia and bordered by India and China, Nepal is perhaps most famous as the home of Mount Everest, but there is so much more to do and see on a Nepal honeymoon—particularly for active couples. Whether you’re a nature lover or more into city life, you’ll find lots of attractions in Nepal, along with welcoming locals and delicious food. Here are some of our top tips for planning a Nepal honeymoon. Nepal is known for having a very active rainy season, which lasts for most of the summertime. The most popular time to travel to Nepal is during the fall months of October and November, when the weather is still warm but drier. Another nice time of year to visit Nepal is in the springtime, particularly March and April, which may be a bit less crowded. The capital of Nepal, Kathmandu is a vibrant city full of history and culture. Ornate temples are a major attraction here, including Pashupatinath, the most famous Hindi temple. There’s also Swayambhunath, otherwise known as the Monkey Temple, where you’ll see lots of monkeys who you’re able to feed, but be cautious as they like to steal tourists’ belongings! Once you’re in Kathmandu, you are relatively close to Mount Everest—about 100 miles away. 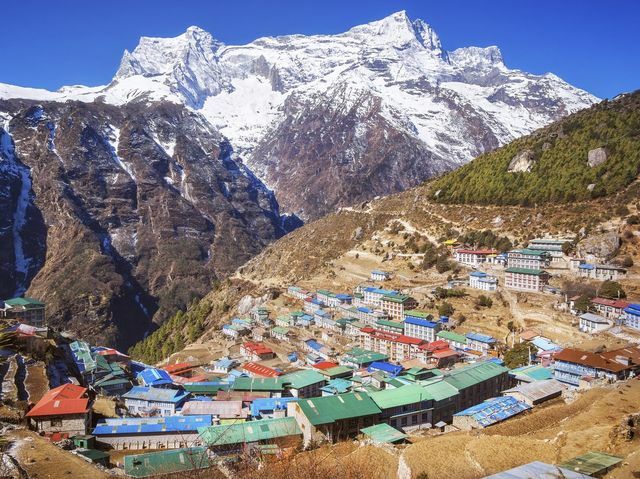 Some couples with ample hiking and climbing experience may want to make the achievable trek to Mount Everest Base Camp (it’s best to hire a guide for your safety, though). If you’re not planning on climbing, you can see the mountain via airplane tour. Many local airlines offer flights over Mount Everest for tourists. There are also easier hikes where you can view Mount Everest in all its glory, including Kala Patthar. And if you’re looking for even more ways to get your heart pumping, you may also enjoy river rafting on the Trishuli River or exploring Langtang National Park. Experience scenic and gorgeous Himalayan views in this village, located about an hour away from Kathmandu. You and your new spouse will love the romantic sunrises and sunsets over the mountains (so ideal for a Nepal honeymoon! ), and adventurous types can enjoy such activities as paragliding, biking, and hiking. The Nagarkot Buddha Peace Garden is a serene spot that visitors love. Pokhara is a favorite spot for nature-loving and active couples on a Nepal honeymoon. This city provides stunning mountain vistas and water-based activities as well. Take a boating trip around Phewa Lake, visit Devis Fall, or check out Barahi Temple. You’ll also love hiking up to the famous Peace Stupa, where you can enjoy gorgeous panoramic views. Brave souls may also want to check out the Bat Cave, where you can get up close and personal with, yup, bats. For those looking for inner peace, there are several yoga and meditation retreats in the area to help you slow down after the hustle of wedding planning. Animal-lovers will want to head to Chitwan National Park, located near the city of Bharatpur. At Chitwan National Park, you’ll find rhinos, Bengal tigers, and much more. There’s also Keoladeo National Park, known for its wide variety of birds. In Bharatpur itself, there are many temples and other attractions to see, including the Government Museum, the Lohagarh Fort, and the Laxman Mandir and Ganga Mandir temples.